We’re yet to see which place this stadium will have as the votes end. We’re also yet to see at least one stadium that would be similar. It’s just more unique than you’d expect. Jacques Herzog and Pierre de Meuron have a goal of building one stadium in each country they work in. In France they created a clear, light and simple, but at the same time revolutionary structure. Instead of using heavy concrete, they placed 20,000 people on a “floating” upper tier, supported by a forest of slender columns. The outcome is impressive, even if you don’t consider it beautiful. If you do, be sure to vote for Matmut Atlantique here! The most famous work of this Swiss design team is Allianz Arena, which has set new trends in stadium design. 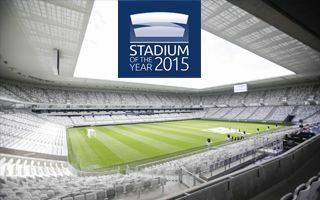 The Bordeaux stadium most likely won’t change as much, it’s simply far too unconventional. No opaque façade, instead a ribbon of kiosks and toilets becomes the barely noticeable outer wall. The entire stadium is built with steel instead of concrete, which adds to its visual (and actual) lightness. Outer form is divided into two distinctive parts. Tall plinth with stairs leading fans inside is covered by a sharp-edged rectangular roof. The choice of this pure and almost abstract form responds clearly and efficiently to the site’s natural conditions and to the main flow of spectators from east to west. This white rectangle seems projected earthwards thanks to the multiplicity of slender columns that shower down. A ribbon of food stalls and restrooms undulates through this forest of columns, brought alive by the movement of the crowd. At once dense and light, this structure creates an evanescent rectangular volume from which the sculpted and organic outline of the bowl emerges. This architectural concept gives a specific identity to the new Bordeaux stadium. The diaphanous volume opens up to the surrounding landscape while the grand stairs express openness and accessibility for everyone. Its transparency reveals all the energy and activities that will transform this piece of land into a new and vibrant part of Bordeaux.